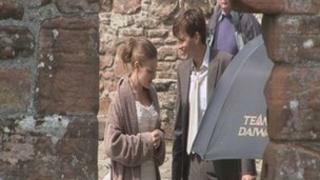 Filming has started in Scotland on a feature film starring the former Dr Who actor David Tennant. The Decoy Bride is set on the fictional Scottish island of Hegg. It tells the story of a superstar actress going to marry her British boyfriend - played by Tennant - away from the glare of the world's media. It is hoped the film can provide an economic boost to the region as previous movie projects have generated about £2m over the past two years. As well as Tennant, the film stars Kelly MacDonald, Alice Eve, Michael Urie, who plays Marc in Ugly Betty, and Federico Castelluccio from The Sopranos. Some filming for the movie has already taken place on the Isle of Man.